We first learned about Anna Maria Horner's project to assist families devastated by the flooding in Tennessee while we were attending Spring Quilt Market in Minneapolis. Naturally, we were quick to jump on board and eager to learn more about how CityCraft could participate. "Not everyone can be on the front lines of an effort like flood cleanup and rebuilding, but we believe that there is always a way to help. So many families lost their homes, cars, and all their belongings during the floods of May 2010 in Middle Tennessee. As they begin their rebuilding process, we hope to combine the efforts of generous quilters nationwide in order to make as many quilts as possible to distribute to families who are in need of new items for their homes. It is a simple mission, but its one that we hope will be far reaching and one that will give homemade comfort to as many people as possible. We are accepting unfinished 12.5in x 12.5in quilts blocks (12in x 12in finished) preferably in a monochromatic color scheme (or two main harmonious colors, like red/orange, or blue/green etc.) in any patchwork style that you'd like. Please also keep in mind that just because we are asking for blocks that are relatively singular in color, that we still encourage all shades, including neutrals and murkier tones, i.e. it doesn't have to be just rainbow brights. There is no limit to how many blocks you can send." 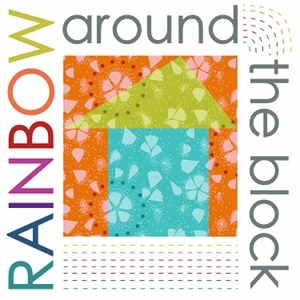 CityCraft will volunteer to be a drop-off point for all Rainbow Around the Block quilt blocks in the North Texas area. CityCraft will also honor and encourage the program by giving any customer that drops off a block 10% off their entire purchase at the time of drop-off. Thank you so much to Anna Maria Horner for organizing and THANK YOU for participating and we can't wait to see what you come up with!